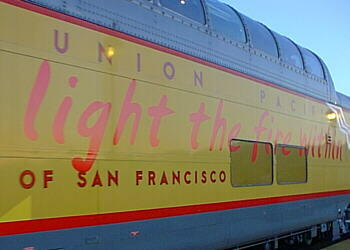 At 5:20pm on January 16, 2002, the Union Pacific (UP) 2002 Olympic Torch Relay Train arrived 10 minutes early at the Amtrak station in Guadalupe, California (about 10 miles west of Santa Maria). This train was immaculate - spit polished! The 18-car consist of traditional UP yellow passenger cars was headed by specially-painted white-on-blue UP diesel locomotives (two SD-70s) numbered 2001 and 2002! Pictures of the lit flame (at right, and below) are courtesy of Steve Alley, and were taken when the train was in Klamath Falls, Oregon - in the snow! It was very early in the morning on January 22, 2002 and it was 12 degrees! The very distinctive Olympic car, built on a former Missouri Pacific (MP) flat car, was used for the 1996 Summer Games torch relay and has been rebuilt and modified for the Winter Games. It has an air curtain surrounding the cauldron (gold-colored "bucket" at the right end of the car as pictured above) to protect the flame from wind as the train moves. It is fueled by propane tanks on the car. The car is equipped with special ramps, stairs, a sound system, lights and music for use in ceremonies enroute. This is the last car of the train. 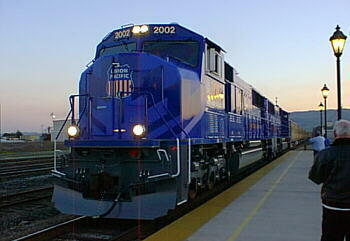 The train entered California from Yuma, Arizona with its first stop in Los Angeles. Before Guadalupe, the train stopped in Santa Barbara, and after Guadalupe went on to San Luis Obispo, Oakland, Roseville, then Nevada and Oregon, and finally Salt Lake City, Utah. This writer spotted several Santa Maria Valley Railway Historical Museum (SMVRHM) members and friends amongst the crowd at Guadalupe braving the colder-than-usual temperatures in the area for this rather rare railroading event. Unfortunately the running of the torch was about an hour late getting to this station, and to add insult to injury, the cauldron did not light when the flame was finally brought to it. A small lantern was used to "pass the torch", and the train pulled out rather anticlimactically heading north to San Luis Obispo shortly after 6:30pm.